Danish Army Specific: The shown vehicle was used as a TACP-vehicle from around 1970. 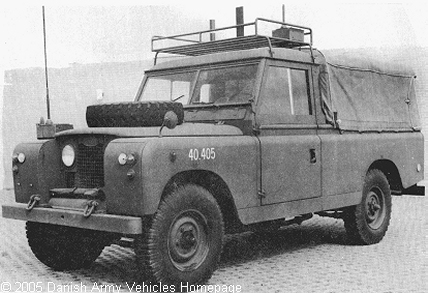 Historical: The first Landrover LWB, the 107, appeared in 1954. It was able of carrying a payload of 750 kg. In 1956 the 107-inch model was replaced with the 109-inch model. From 1957, as with the 88, a diesel-engine became available. Developed through Series II (1958), series IIA (1961), Series III (October 1971) and the 110 (1983). A special extended version were the 127 with the well known V8 petrol engine used as a Rapier missile tractor. Length: 4.44 m (173 inches). Width: 1.68 m (65 inches). Height: 2.06 m (80 inches). Weight: 2.650 kg (5.830 lb.). Engine: Land Rover 4-cylinder, 2.286 cm3 (139 cubic inches) displacement, liquid cooled. Horsepower: 70 at 4.250 rpm. Fuel capacity: 45 liter (10 gallons). Range: 150 km (94 miles). Additional: For aircraft communication the vehicle carried an EL/K-1004 radio set.